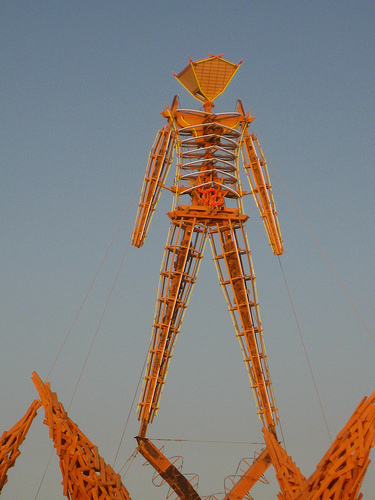 The Daily Clog » Um … Berkeley Lab and Burning Man? But, wait a second — will hippies and other Burning Man good-vibers even care about the time? Meh, either way, as long as this clock turns out better than the World’s Tallest Thermometer in Baker, California, we here at the Clog say go for it, Mr. Bowers. Make us proud! Clarification: A previous version of this story may have implied that Jim Bowers’ team was sponsored by the Lawrence Berkeley National Laboratory, but this project is actually unaffiliated with the lab. Thank you, Mr. Bowers, for pointing out the error. The post has been edited and a clarification included accordingly. Something more important is that when searching for a good internet electronics shop, look for online shops that are constantly updated, retaining up-to-date with the hottest products, the most effective deals, in addition to helpful information on products. This will ensure that you are dealing with a shop that stays on top of the competition and offers you what you need to make knowledgeable, well-informed electronics purchases. Thanks for the crucial tips I have really learned from the blog. Keep up the wonderful piece of work, I read few articles on this site and I believe that your website is very interesting and holds sets of good info. Pretty section of content. I just stumbled upon your Tim Tebow Jersey Jets website and in accession capital to assert that I get actually enjoyed account your blog posts. Any way I’ll be subscribing to your feeds and even I achievement you access consistently rapidly. I am very interested in this subject recently, and watching him closely. I am glad for commenting to make you understand what a fantastic encounter my wife’s girl developed reading your web site. She came to find plenty of details, most notably how it is like to possess an awesome giving mindset to let other people effortlessly grasp some complicated topics. You undoubtedly surpassed her expected results. Thanks for coming up with those insightful, trusted, educational and in addition cool thoughts on this topic to Julie. Thank you for every one of your work on this blog. My niece enjoys managing internet research and it’s simple to grasp why. I learn all of the lively form you create rewarding thoughts on your website and invigorate contribution from others about this topic so our simple princess is truly understanding a great deal. Have fun with the remaining portion of the year. You’re the one doing a terrific job. Have you ever considered about including a little bit more than just your articles? I mean, what you say is fundamental and all. But imagine if you added some great graphics or video clips to give your posts more, “pop”! Your content is excellent but with pics and video clips, this site could certainly be one of the very best in its niche. Terrific blog! Hey very nice site!! Man .. Excellent .. Amazing .. I’ll bookmark your site and take the feeds also…I’m happy to find numerous useful information here in the post, we need work out more strategies in this regard, thanks for sharing. . . . . .